The scope of this ambitious work is captured in its subtitle: A Fisherman’s Natural History. 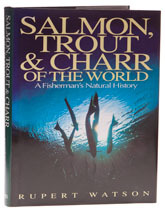 In the space of 312 well-indexed pages, Rupert Watson deals with thirteen different species: Atlantic salmon; brown trout; arctic charr; lake charr; brook charr; rainbows; cutthroat trout; and Pacific salmon. Sadly, he leaves out huchen and grayling, but I guess you can’t have everything. The section on Pacific salmon is a quick skate through all six species, although he makes up for it with a terrific chapter on Pacific salmon ecology, which highlights how the same mistakes get made the world over where the management of fish stocks are concerned. Although the author is an angler, he doesn’t shrink from pointing the finger of blame at rod and line fishermen and there are some hard hitting passages. In particular, his views on hatcheries and stocking levels make uncomfortable reading and readers will find themselves squirming in their seats from time to time. Despite its slightly technical approach, Salmon, Trout and Charr of the World is extremely enjoyable and the illustrations are of a particularly high standard.